We have grown a new vegetable in our garden this year. 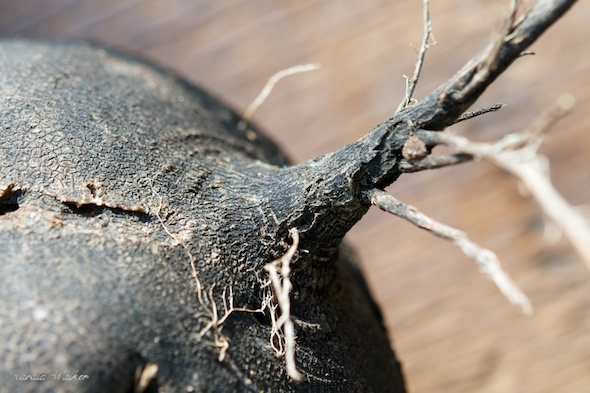 It’s often considered to be a forgotten vegetable – it’s a Black (Skinned) Radish (Rapahnus sativus). What a surprise it has been. It’s delicious, mild and crispy and is considered good to grow in the winter. So, now that our black radishes are mature, we have been looking for recipes to use this tasty vegetable. We came across many nice recipes at Martha Stewart’s. Often the recipes use the traditional red radish, but the black one is a nice milder substitute. 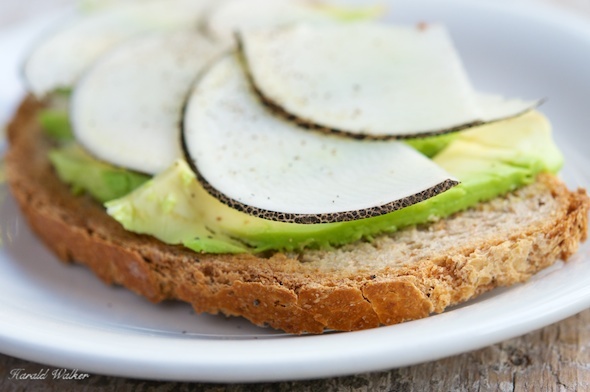 Our first recipe from Martha was the radish and avocado sandwich. It was very tasty and easy to make, although with the mild black radish, it was a bit on the mild side. A dash of Tabasco helped that. The second recipe we made from her selection was the radish canapes. 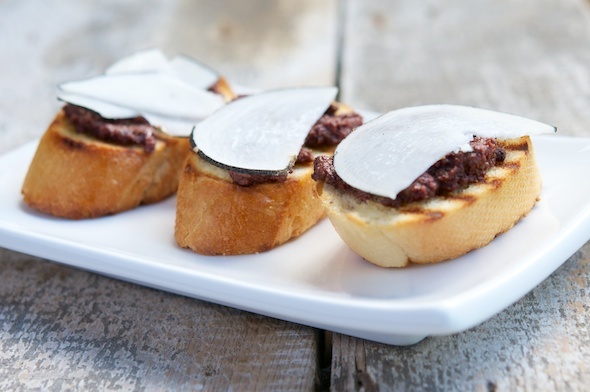 Instead of black-olive butter we used black-olive tapenade (without anchovies!). It was quicker and easier. This was very tasty lunch and would also make good finger foods for parties. It is also important to slice the radish thinly, a mandolin would help with that. Posted by Chris Walker on October 29, 2012 in Avocado, Radish, Reviews.